Many programs are available to help critically ill patients; however, few people are as into their ministry as the Experience Genie. 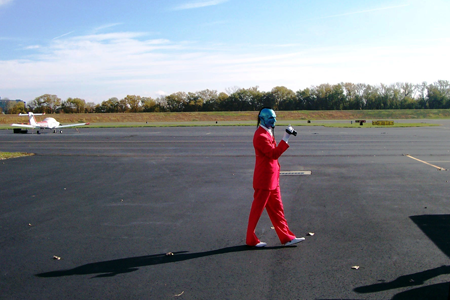 The Experience Genie paid a visit to Premier Flight Center’s office at Hartford-Brainard Airport (KHFD) on October 26, 2010 along with his friend Rose! The Experience Genie “travels the world looking for people to take on a dream day of experiences.” The “experience” often includes a “drive in an exotic car”, “a stay at a unique hotel and other unique experiences related to the destination city”. 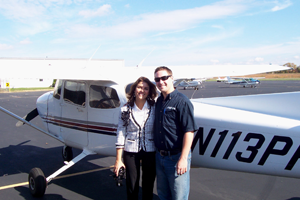 For Rose, the day included a flight around Central Connecticut with Premier’s Chad Decker in Skyhawk 113PF! Experience Genie “has been on Fox, NBC, ABC, CBS, CW, City TV, CTV, Global TV and featured in many newspapers including the New York Daily News and Miami Herald. In all, he's granted 40 Dream Days in the past year and been featured in over 100 news stories around Canada and the USA”. For more information about Experience Genie and some additional photos, click here to visit his web site and read his blog.